Mini Cirque brings a circus entertainment experience to corporate, private or public events. We offer four types of performances: a Fire Show, a UV/Glow Show, a Hula Hoop Show and Roaming Animation. Mini Cirque performers are perfect for local and international festivals and fairs, parties for children and adults, night clubs, weddings, corporate events, team building workshops and other special events. 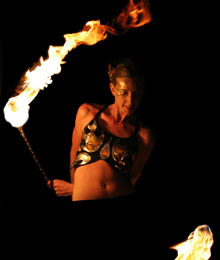 The Fire Weavers are a world-class fire dancing group. Performed after dusk or indoors (in certain locations) these shows are highly original and breathtaking performances. This high caliber show is a femaletrio, duet or solo involving a blend of dynamic dance, acrobatics and artistic fire spinning. The Fire Weavers have a comprehensive web site that includes everything you want and need to know about fire shows. Or find out more about Fire Weavers on this site. Performed under Ultra Violet (Black) light, this performance is next best to the fire performance in venues where fire is not possible. This female trio, duet or solo involves dance and manipulation of glow-in-the-dark high tech circus props for a highly visual effect. Find out more about UV / Glow. This full length show for all ages presents several impressive professional circus acts using circus props such as hoops, flower-stick, poi and knife swinging as well as dance, acrobatic and audience partication all set to music in a professional costume. This show is great for schools, day cares, birthday parties and large events and can also include workshop for school age kids. The show leaves kids inspired and empowered. 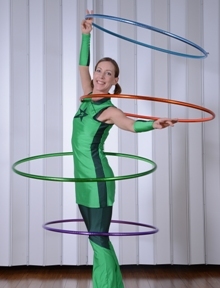 Twirling hoops on and around all parts of their body fusing circus skills and urban dance, these artists takes over the stage with their multiple hoops and a graceful dynamic energy and gives the audience a treat of elaborate skills and tricks. Perfect for daytime or indoor events. Available in solo, duet or trio. 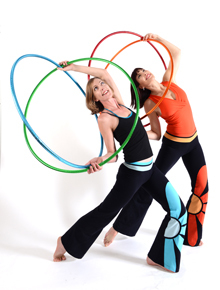 Find out more about the Hula hoop number. Fabulously dressed in original costumes, roaming stilt characters, jugglers and animators provide ambience and can break the ice at any type of event. Find out more about our Stilt Walker and our Roaming Animation. All content and images © Mini Cirque 2003-2008.